Bungoma senator Moses Wetangula is not dead despite a rumor that has been doing rounds on social media that the CORD leader died in a car accident earlier today. the rumors have been dismissed by the CORD leadership led by Eliud Owalo who said that some people are spreading false rumors about the senator trying to weaken the party's position especially at this time when things are moving in the right direction. According to Eliud, some bloggers supporting the Jubilee party have been spreading rumors most part of the day that the senator was involved in a fatal road accident around Naivasha today. “This talk and posts on social media about Senator Moses Wetangula having been involved in an accident in Naivasha is an unnecessary Political Propaganda and absolute nonsense. 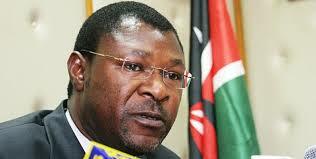 "Propaganda doing rounds in the media about Sen. Moses Wetang'ula is silly & shallow. He is currently on the floor of the House in good shape & health. He has not been out of Nairobi since Sunday. Such propaganda is unhealthy and only aimed at causing unnecessary anxiety among the public. The orchestrators of this propaganda are desperate and short of ideas"
A guy using a fake twitter account with the name of Boni Khalwale seems to have started the rumor, which spread life wildfire.